Our Chapter was chartered in 1973. 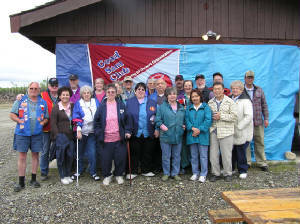 In 2006 Tundra Rollers has over 60 members and over 30 RV's involved in our Chapter Activities. We meet monthly. During the Winter we meet at Santa Senior Center in North Pole, Ak. During the summer our meetings are held at various locations around the Interior. Please call Randi Owen, (907)-869-3400. Hours are from 11 a.m. to 3 p.m.
Our chapter also raises money to donate to Dogs for the Deaf and local charities during the year. Please come and visit our Chapter, We would love to share some of the fun that we have in the great Alaska outdoors. Contact (907)-699-2420. Please come visit our Good Sam Chapter. We are the only Good Sam Chapter in Santa Claus land.